Rhiannion Marshall, who has joined Castleford Tigers women from Leeds Rhinos. Castleford Tigers Women have made a huge statement of intent ahead of the 2019 season with the signing of Rhiannion Marshall. 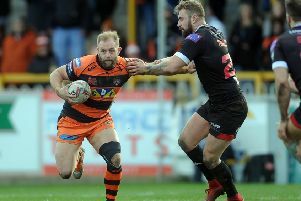 Marshall was one of the key players in the Leeds Rhinos side that won the Challenge Cup and reached last season’s Grand Final. The 25-year-old decided to leave the Rhinos and approached the Tigers upon her return from the international break. Marshall said: “I wanted to progress and get a little bit more experience playing with a new coach and playing alongside new people. The forward has a wealth of experience, having previously played for Bradford Bulls. She was at the club in 2017 when the Bulls made history by going the full calendar unbeaten and claiming the treble. The Doncaster-born player believes that her experience, particularly in the forwards, will aid the Tigresses in their pursuit of major silverware. She said: “I think the future is very bright for Cas. There’s a lot of young players here, very talented players as well.